When it comes to promoting their unique Koshu wines, the Japanese aren’t taking any half measures. At their recent annual trade tasting in London, they had not one but two masters of wine on hand – Lynne Sherriff and Jancis Robinson – to talk up Koshu and educate the uninitiated. Of which there seemed a fair few, despite this being the third year Koshu of Japan (KOJ) producers from Yamanashi Prefecture have shown their wines in London. I was one of them and keen to learn. Lesson number one: don’t expect big aromas and flavours despite the fact the Koshu grape is tough, thick-skinned beast. “These are lightly aromatic – not jump-out-of-the-glass wines,” explained Lynne during a masterclass and tutored tasting. These white wines are also low in residual sugar (what’s left over after fermentation) and in alcohol. The wines I tasted ranged from 10.5% – 12% alcohol by volume (ABV). Lesson number two: Yamanashi, in the shadow of Mount Fuji, is famous in Japan for growing fruit, especially apples. But it sounds a total pain for growing grapes that make quality wine. Summer rot is a real problem as 80% of rainfall lands in the growing season – it can be very heavy. Last September, there were two typhoons. Millerandage (where not all grapes on a bunch develop) can also be an issue. “A lot of very precise work is needed in the winery to give the wine some body and flavour,” said Jancis. Lesson number three: despite the Koshu grape’s origins coming from vines traded along the silk road, and a wine industry developing in the late 19th century, these crisp, light, delicately fruity wines are a recent style. Lesson number four: it’s unlikely you will find Koshu wines in your local supermarket anytime soon because, at around £18 for the still wines, they’re too expensive and unknown. 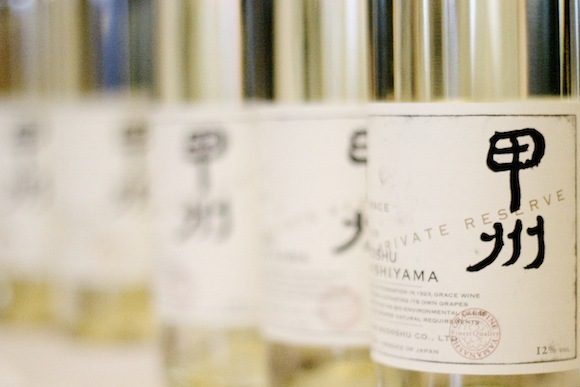 You can find Koshu in some specialist retailers though – such as Amathus and Selfridges. “I do see a place for them on restaurant lists,” said Jancis. With mark ups on top, I imagine we’re talking fine dining and high-end Asian cuisine, though I’m keeping my fingers crossed that some mid-range Japanese restaurants will also see the light and ring the changes from sake and beer. Finally, lesson number five. 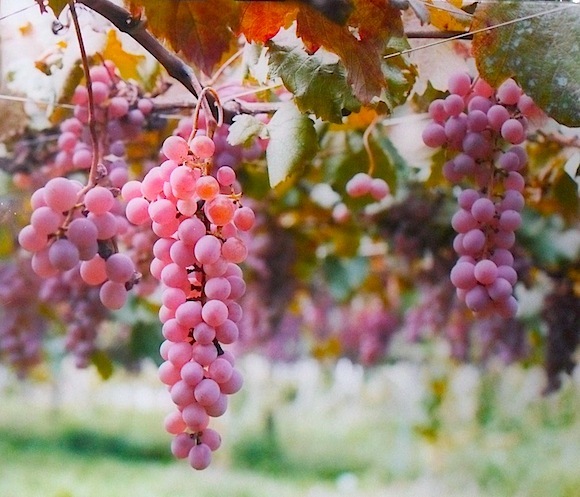 The Koshu producers have committed to radiation test their wines for many years to come, following the post-tsunami Fukashima nuclear disaster. The wines we tried from 2011 were tested in Japan and then twice by UK customs. There were 13 producers showing Koshu wines at the event. The most assured were those from Grace Wine, a family-run business that has been at the forefront of introducing global techniques into their viticulture. The winemaker – the daughter of the fourth generation owner – trained in Bordeaux. Her Koshu Kayagatake 2011 was impressive in that it had what appeared to be a dainty lime flavour on first sip that just went on and on, well after I’d spat it out. I also tried the Koshu Hishiyama (single vineyard) 2011 – gossamer and precise – and the slightly more ample 2010 which felt a little creamy and had a hint of stone fruit. Other Koshu wines that stood out for me were those made by L’Orient, Rubaiyat and Marquis – the latter probably because it had a touch more residual sugar and a more intense fruitiness than the others and was a bit more familiar. It was the one I could imagine serving to friends without food. 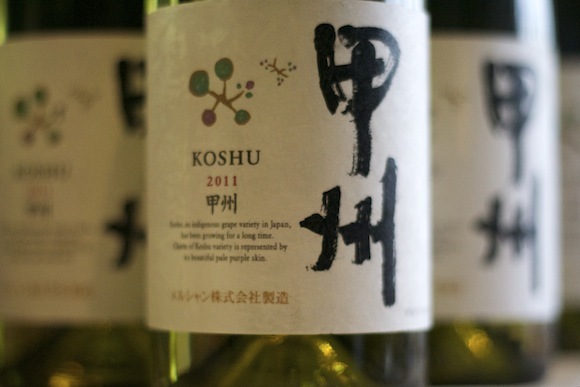 An honourable mention goes to Soryu Koshu 2011 – super clean and only 10.5% ABV. I was less convinced by a couple of the sparklers I tried, but as one importer told me, they were still a ‘work in progress’. I’ve said Koshu wines were delicately fruity. I also detected savoury hints in most of them too. Looking back in my notes, I see smoke, salt and cheese rind written by a number of the wines and – dare I say it – sake. Which is what makes these wines distinctive and different – though not unappealing. Few of them I would drink on their own. But I am planning to buy a bottle and try it with food at my local Japanese BYO restaurant. I’ll let you know how I get on. 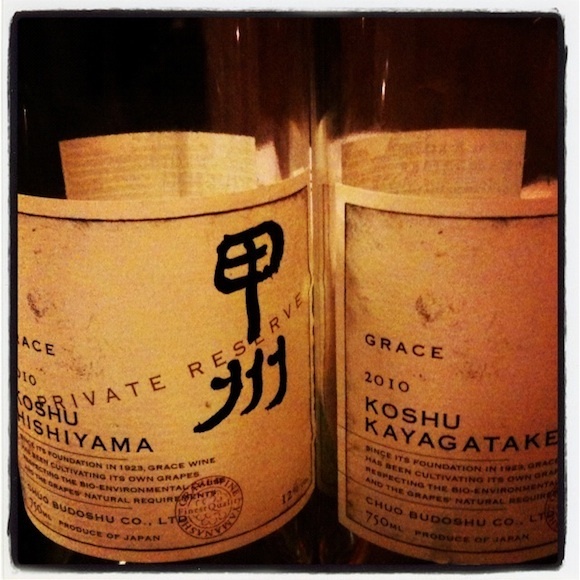 So I bought a bottle of the Grace Kayagatake and was given a bottle of the Hishiyama 2010. I drank them, as planned, at a local Japanese BYO with friends. The Kayagatake went best with sashimi and tempura. The Hishiyama was better with the meatier dishes, though not brilliant with beef. As you might imagine. It was worth doing, but I couldn’t help thinking of cheaper alternatives that would work well too. Maybe a Picpoul de Pinet, a richer-style Muscadet or a dry German Riesling from Nahe. Or perhaps, for that more savoury edge, an aged Hunter Valley Semillon. Nice write up on an interesting topic.